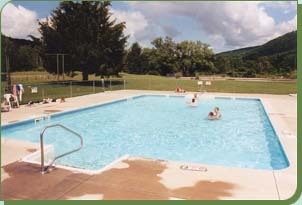 Welcome to Ferenbaugh Campsites in Corning, southwest New York where you will find a quiet, friendly country valley waiting for you and your family. Ferenbaugh sits on 274 open and wooded acres with a 40 ft. wide creek, nature trails, fish pond and much more. We offer 115 wooded and 30 pull-thru campsites for your RV, Camper or Tent. Slideouts and BIG Rigs are welcome. Our pull-thrus have 30 and 50 amp electric, water, sewer and cable TV and FREE WiFi. The wooded and creek side sites have 20 and 30 amp electric and water service. Our office has FREE WiFi and a modem connection so you can stay connected and check your e-mail. We also have a couple of large handcrafted rental cabins overlooking Post Creek. We've also got the extras that make your camping visit with us more convenient and comfortable. Use our sparkling Showers and Bathrooms. Camping with us means you have access to Propane Service, Laundromat, Dump Station and Pay Phones in the park. So feel free to use these services and if you need any help or need assistance our camp office is located with the Rec Hall on the west side of the bridge. Ferenbaugh Campsites facilities encourage relaxation and fun times with the family! Our new pool beckons for your swimming enjoyment. Stop by and spend some time at our recreation building for some ping pong, pinball, video games and more. Outdoor activities are plentiful here including: Mini Golf, a Playground, Badminton, Volleyball and more! If you've got a sweet tooth visit the snack bar for a treat and Hershey's ice cream hand-dipped to help end the craving. Short on groceries or supplies? Visit the Camp Store for anything you need, things you forgot to pack or just a fun souvenir to commemorate your great time with us at Ferenbaugh Campsites. We've got planned activities for you and the youngsters! Find out what families are up to here at the park. Corning is home of the Corning Glass Museum and the Steuben Glass Factory. Plus we are nearby to many other attractions like the Finger Lakes Wineries and the Watkins Glen Gorge. There are also several golf courses and shopping malls nearby plus much more! So come and receive a warm welcome at Ferenbaugh Campsites!